Willard is a kindhearted wise old wizard. He values reading skills. As a young orphan who could not read, he was ousted from the local school of wizardry. The schools librarian took him under his wing and taught him how to read. With his newfound reading skills Willard became a self taught wizard by reading hundreds of books on magic and wizardry. He is the guardian of a magic bookmark. The bookmark tells a wizard where to look to find information on a specific trick. He now runs his own school of wizardry. Harriet is a charming young orphan girl who want's to learn about magic and wizardry. She becomes very enthusiastic about her magical quest when she is invited to study with Willard the Wizard of Wisdom. Although she can read, Willard encourages her to sharpen her reading skills. As the story progress she becomes aware of just how important reading can be and learns about the Dewey Decimal System. She is eventually entrusted with protecting the coveted bookmark from Lotar The Wuzard. 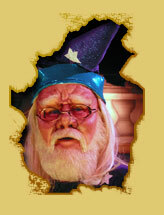 Lotar was a wuzard, but was expelled from the Honorable Society of Wizards for performing unkind feats of wizardy. Expelled members are referred to as Wuzards. Lotar wants to tease and antagonize others with his wizardry, not enchant and entertain them. For example, he teaches Harriet how to set one of Willard's books on fire when he opens it. His goal is to steal the magic bookmark from Willard and use it to learn feats of wizardry of a naughty and unkind nature. Lotar tries to befriend Harriet and trick her into thinking he is actually a nice guy that has just been given a bad rap.